Public access to the refuge is available at Mile 3, Egan Drive from a parking lot cul-de-sac near the radio station or off Berners Avenue just west of the airport along the Mendenhall River. A popular scenic view turnout for eastbound traffic at Mile 6, Egan Drive offers parking , a viewing platform, and interpretive signs for the refuge. On Douglas Island, good public access is available from a large parking lot at Mile 8.5, North Douglas Highway, just before the Fish Creek bridge. There is a public boat launch at Mile 9.5 on Cove Creek. 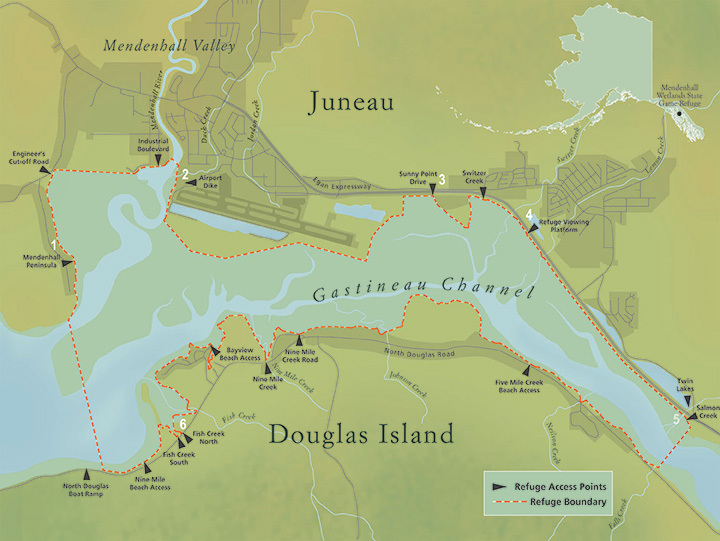 Additional public access sites along the shoreline are identified by Juneau City and Borough trail signs. Safety precautions on the tideflats are essential. Always consult a tide book before venturing out onto the refuge. Drive to Engineers Cutoff Road and park at the top of the hill for best access to the wetlands west of the Mendenhall River. Walk down the embankment to the wetlands. At low tide, much of the tidal flats are open for exploration. Turn off Old Glacier Highway onto Berner's Avenue just beyond the airport. Turn left on Radcliffe Road and park where the road deadends at the airport security gate. Walk along the road at the end of the runway until you reach the dike beside the floatplane pond. From here you can walk along the Mendenhall River, lower Duck Creek, and across the wetlands at low tide. Shorebirds, waterfowl, seabirds, and songbirds are abundant. Park along the access road at Sunny Point, off Egan Drive across from Switzer Creek. You can walk across wetlands at low tide. Respect private land. In early spring, this is an excellent place to see feeding Canada geese. A scenic view turnoff for inbound traffic at Mile 6, Egan Drive, offers a view of most of the refuge and the Thomas Glacier. Ample parking is available. Interpretive signs on the viewing platform explain the natural history of the refuge. Use caution when hiking the wetlands here because there are rapidly flooding tides. The public access road at Mile 3, Egan Drive, leads to a cul-de-sac with parking near the radio station. Waterfowl concentrate near the mouth of Salmon Creek in late summer and early fall, when spawning salmon migrate upstream. Drive to the large parking lot at Mile 8.5, North Douglas Highway, just before the Fish Creek bridge. Pink and chum salmon migrate up Fish Creek to spawn in late summer and early fall. Mudflats near the mouth of the creek attract shorebirds and gulls; waterfowl use nearby sloughs. A dike allows foot access to Entrance Point where you can view seabirds in Fritz Cove, shorebirds along the stream, and songbirds and birds of prey in the adjacent forest.